Most of the aspiring entrepreneurs look at Amazon and eBay in hopes of seizing ecommerce riches. However, with the speed at which ecommerce sector is evolving, it has become highly difficult to ascertain where it is headed. The market is poised to grow further and will keep on growing for years to come. However, by just putting across a website you cannot expect the market to hand you the money. There are certain aspects that you need to keep in mind before you go about launching an online store. Other than creating a formidable ecommerce marketplace with a long list of features, you also need to analyze your targeted market and optimize it accordingly. 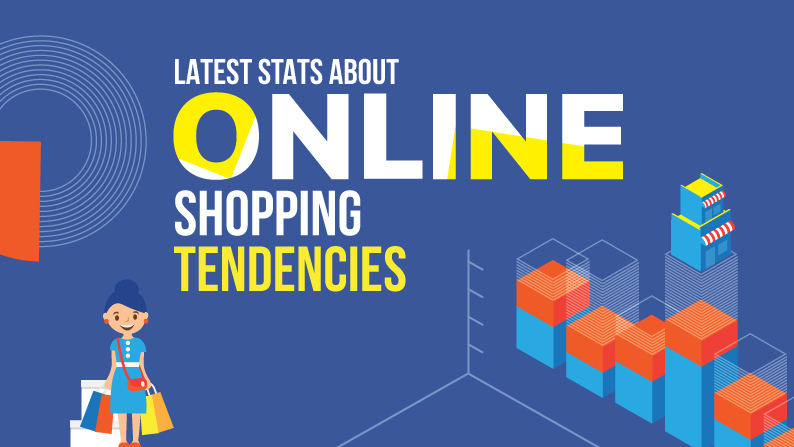 After spending countless hours on different studies, surveys and reports, we came across some crucial statistics that showcase the overall ecommerce industry. For everyone, associated or aspiring to be associated with ecommerce business it is a must to keep tabs on crucial market statistics. Delving into the numbers below will help you paint a crystal-clear picture of ecommerce- past, present and future and latest online shopping trends. Over 46% of the Internet users have made a purchase online via desktop, mobile, tablet or other online services in 2017. That amounts to 1.7 billion out of 3.66 billion internet users. 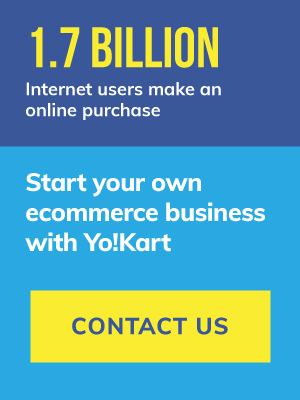 In the next two years, a number of internet users who make an online purchase at least once will surpass 2 billion mark. The digital buyer penetration worldwide currently is at 28.6% of the overall population. This figure is expected to rise to 32.8% in the next two years. This means nearly every third person on this globe would make a digital purchase. The conversion rate of ecommerce websites globally is 2.95 percent. This has gone up from 2.46 percent from the previous quarter. However, the conversion rate has come down from YOY basis from 3.26 percent. This can be due to multiple ecommerce stores mushrooming during this period. As far as conversion rate based on platform is concerned desktops still had a lead over smartphones with 4.14 and 1.55 percent respectively. This means desktop websites are able to convert almost three times as much as mobile counterparts. There has been a consistent rise in ecommerce share of the global retail sales since the last few years. In 2016, it was 8.7 percent while it has risen to 10 percent this year. In the next 2-3 years, this figure is expected to cross 15 percent. The global ecommerce retail sale in 2016 was $1915 billion and has already crossed $2352 billion in 2017. Online shopping has become one of the most popular online activities worldwide with e-retail revenues expected to cross $4 trillion by 2020. The global e-retail sector is growing at the rate of 22 percent YOY and is expected to do so till 2020. UK, South Korea, and Germany topped the charts of highest online shopping penetration at 76%, 72%, and 72% respectively in the fourth quarter of 2016. Japan with 68% came in at third while the USA was placed fourth at 67%. Asia-Pacific region is leading the pack with its e-retail sales clocking 12.1 percent of overall retail sales, compared to 8.1 percent in North America. China leads the pack when it comes to retail ecommerce sales at $911.25 billion in 2016. 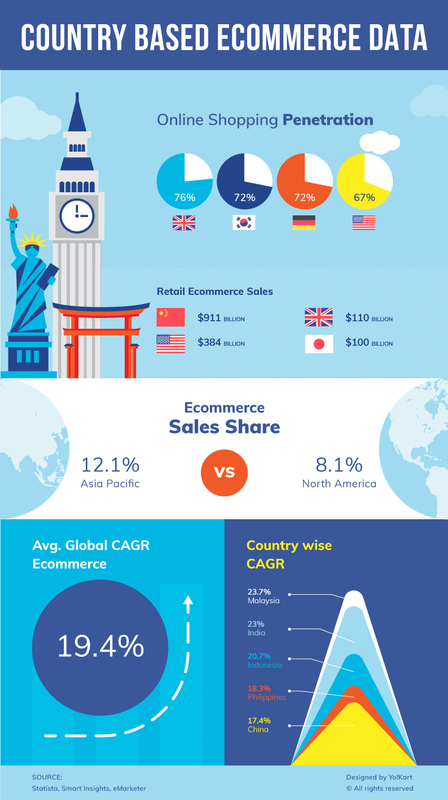 USA, UK, and Japan follow China with $384 billion, $110 billion and $100 billion in retail ecommerce sales respectively. When it comes to B2C ecommerce markets, the same trend follows with China at $975 billion, USA at $648 billion and the UK at $192.5 billion. Malaysia and India have the highest compound annual growth rate when it comes to ecommerce. While Malaysia has a CAGR of 23.7 percent, India comes in close at 23 percent. The top two most popular online shopping categories worldwide in the last quarter of 2016 were fashion and travel. While 58 percent of global internet users purchased a fashion related products, travel-related products and services ranked second with a 55 percent global online purchase rate, while electronics came in at a distant third. The leading online purchase drivers which entice consumers to make a purchase online are free delivery (63%), discount coupons (41%), Quick and easy checkout (39%) and easy returns (38%). Almost 16 percent of the online shoppers worldwide make an online purchase once a week. This figure rises to 23 percent for once every 2 weeks and 31 percent once every month. An average value of global online shopping cart during last quarter of 2016 on a desktop was $143.35. The same for smartphones was $114.52. Consumers who came directly on the website have an average shopping order value of $129.92. Those who come from search engines have an average shopping cart value of $121.98, while those coming from social media had $91.67. Around 41% of the global consumers prefer PayPal as a payment method, while 31 percent choose a credit card. Around 18 percent choose bank transfer and just 4 percent opt for cash on delivery. 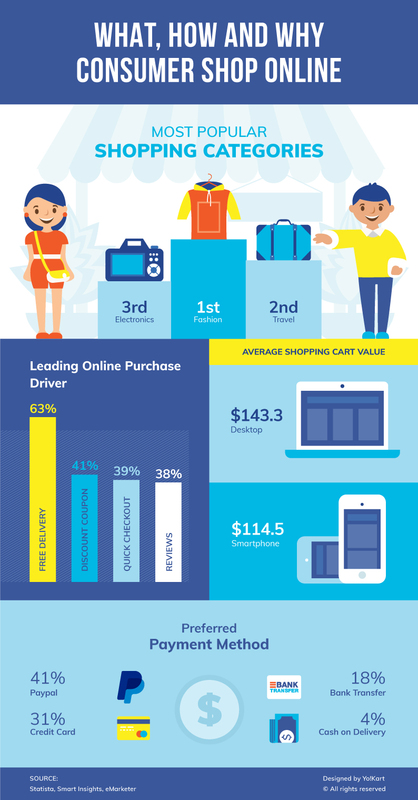 All these stats provide crucial insights into ecommerce market. They highlight a clear picture as to how, when, why, where, what the consumers are shopping. This data is very vital for any ecommerce store as with it one can alter their strategy and capture the market easily. The overall ecommerce sector is getting populated with new online stores coming into the picture, so it becomes important for entrepreneurs to act innovatively while creating their business strategy. If you manage to build a formidable marketplace based on these statistics, then there will be nothing holding you back from capturing the market.